North East Ice, a harbour-based company in the port of Peterhead, delivers fresh ice in Dolavs for local fishing boat operator's catches in the fish auction and local fish processors and merchants. The new clean fresh flake ice keeps the fish cold and improves presentation for auction. 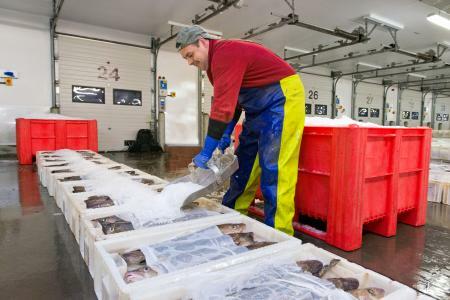 For the fish processors and merchant who buy the fish, North East Ice supplies its flake ice to keep fish cold and for packing fresh fillets for delivery to end users. Cleanliness and hygiene is to normal high standards for food production for human consumption. Flake ice being used to ensure fish is kept fresh. All the ice is delivered in red Dolavs which travel four-at-a-time for only a few hundred yards on a flatbed. Unloading is usually by electric forklift. North East Ice has been providing ice for more than 15 years and Alan Thoirs said, "We tried other bins of about 600 litres but found the Dolav Ace stood up best to use. We also tried insulated boxes which proved too heavy as much of the handling is manual." The ice is frozen to sub-zero and so that is the temperature at which the Dolavs operate. North East Ice uses 15-20 Dolav Aces made in red HDPE and weighing 36.5 kg empty. The flake ice is classed as a food and must meet food production hygiene standards so North East Ice conducts routine tests to confirm no contamination and regularly cleans its equipment including the Dolavs. Campden BRI recently confirmed the Dolav Ace of being of 'hygienic design'. 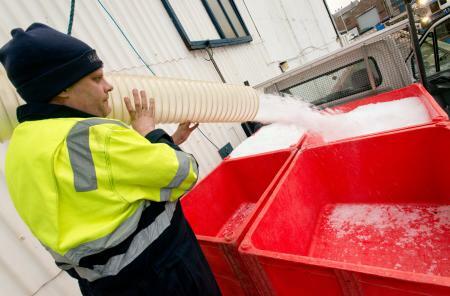 North East Ice makes its own flake ice from mains water and keeps it in a 100-tonne store ready for delivery as called for when the fleet comes. That can cause a large demand in a very short time depending on the catches being landed. North East Ice responds immediately and fills its Dolav Ace plastic pallet boxes and delivers flake ice at speed to the fish auction and fish processors as fast as they need it.